"At one point a girl at my table actually had to get up and leave because video after video they showed black people being assaulted by police or black people being verbally assaulted and white people being racially biased toward people of color," a young black female Starbucks employee told Philly Mag after being forced to take part in their "racial sensitivity" training course this week. Starbucks billed Tuesday's training as "one�step" in addressing racial bias, and national reports have called the company's move an "important start." But for two Philadelphia Starbucks employees I talked to, the training merely "targeted" people of color and exacerbated racial tensions. Both baristas told me that the training had missed the mark completely. Instead of addressing racial tension head on, the training mostly "beat around the bush," said one of the baristas, a 24-year-old Latino man we'll call Jamie. "I was really disappointed when I walked out of there because I was expecting so much more," said the other barista, an 18-year-old black woman we will call Tina. [...]"It felt like we were off task the entire time because we didn't reflect on the situation itself," said Tina, who has worked at Starbucks for a year. "The training materials focused a lot on police brutality, which had nothing to do with the incident that happened." "The videos of cops knocking people down and fighting people were really disturbing," Tina explained. "I told them I didn't like the video and they told me they understood and that I was open to give my opinion." What does watching videos about police brutality have to do with the situation that happened, Tina said she kept asking herself. "They went too deep into it and missed the point all at the same time." "At one point," said Jamie, "a girl at my table actually had to get up and leave because video after video they showed black people being assaulted by police or black people being verbally assaulted and white people being racially biased toward people of color. It offended her. She left after that." "We got too deep into black history and got past what I thought was the point of the session," Tina said, pointing out that one of the videos they watched went back to lunch-counter sit-ins of the 1960s. [...]As Starbucks previously announced, the training videos featured the rapper Common, but it was unclear to the baristas why he was included. "It made it seem like they were pandering to us as a people, which is rude," said Jamie. "What does Common know about anything that we're going through? What does he have to do with anything?" [...]Though Starbucks attempted to get people to confront stereotypes and unconscious biases with the new phrase, the exercise left Tina feeling singled out. "I feel like a lot of people of color were targeted [yesterday], and I know that wasn't the whole objective of having that meeting," said Tina. "Every activity focused on people of color and how they feel about their race." Tina left all of the following questions in her journal blank, calling the exercise "just ridiculous." Starbucks exec Howard Schultz is a sick person who wants to exacerbate racial tensions to advance his un-American agenda (there's a good chance he's going to try to run against Trump in 2020). 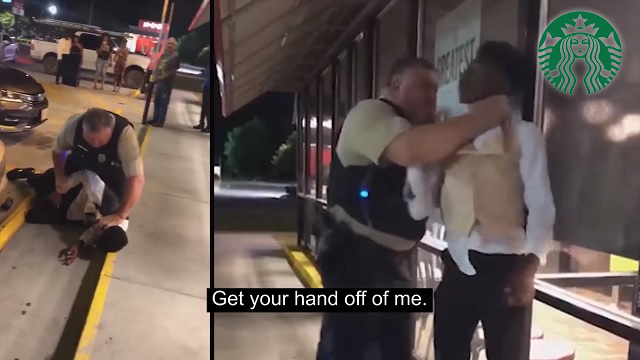 The 16-year-old black teen seen being choked by a cop in that Starbucks propaganda video started a "riot" inside the Waffle House he was eating at and two people called 911 on him. He was "choked" because he was aggressively resisting arrest. The only purpose of a propaganda reel like that is to generate anti-white racial hatred -- which is exactly what Schultz and his Democrat cronies want to drive up turnout for 2020.